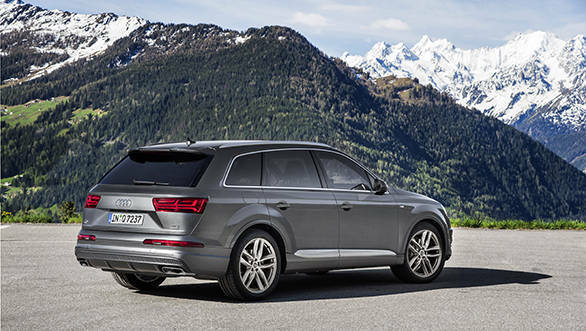 The most important model in Audi's portfolio, the Q7, has become a brand in itself. It has stayed strong for over a decade now and dealers are still getting enough orders to question the very need of a successor. But consumer demand aside, the Q7 has grown old and the age shows in every bit of the massive SUV. Its decade-long tenure though has allowed Audi to wait for the right time and build the successor on the Volkswagen Group's versatile MQB platform. The wait seems well worth it. 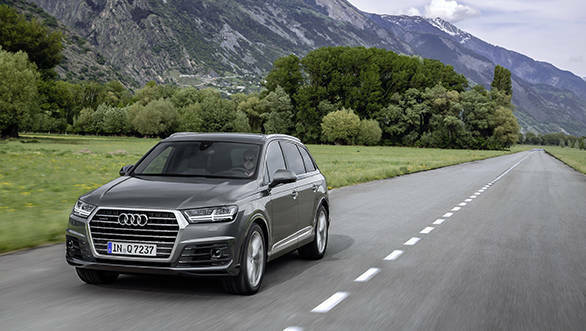 The moment you get the second-generation Q7 rolling, you know that a lot has changed - from the way the new cabin wraps around you to sitting lower and piloting a plus-size SUV that feels unbelievingly nimble. With the new platform, the Q7 has managed to shed almost 325kg. Like most new age SUVs, there is a combination of steel and aluminium parts in the construction of its chassis. But the material weight isn't everything. Weight is also being saved in almost every component of the car - including the suspension, the seats, the exhaust system and even the cooling mechanism. The result? The Q7 tips the scales at a little under two tonnes, depending on the spec and equipment you choose. The Q7 now looks leaner as well, with tighter lines. The attention grabbing arrow-shaped headlights are similar in theme to what you see on the new A6/A7. 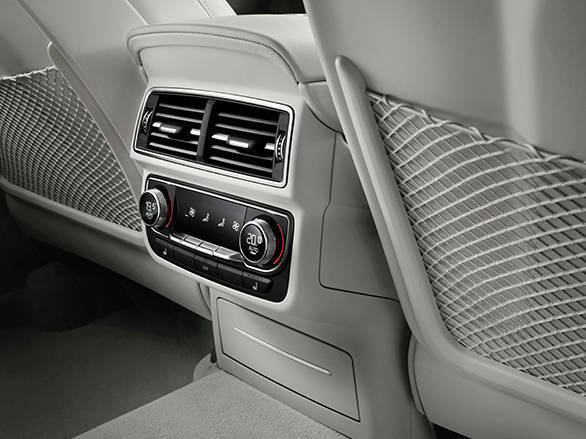 Since it is a Q7, there is plenty of bling as well - for instance, the satin-finished single-frame grille and a matching appliqué on the doors with the quattro insignia on them. I hope it doesn't get chrome tattoos on its way to India. The door appliqués could look like rub rails to you, but won't look pretty with scratches on them. All creases on the Q7 are straight-ish to highlight the large dimensions of the car, but the second-generation model is actually smaller in size. The sharp lines make it look athletic. Spec it with the 21-inch RS rims that Audi is offering and the body looks sportier. For India though, I think the 19-inchers will make most sense - they won't look as small as the 18-inchers nor will they be as harsh to ride on as the 21s. The car sits on a superb 235mm ground clearance which should be more than what you need for the road. 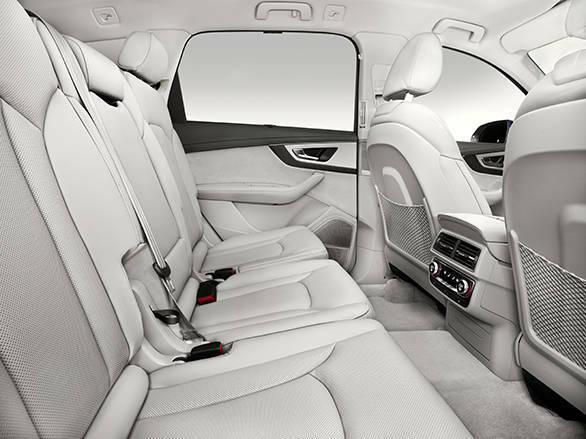 Though the body looks tall, you tend to sit lower than the outgoing model. As a result, the Q7 now feels more car-like to drive than SUV-. It still offers a commanding view of the road and I think that balance works well. The dashboard isn't too deep and the windshield is adequately large to give you a clear field of view. The cabin instantly reminds me of the Passat B8, thanks to the seamless air-con vents that run across the width of the dash. The fascia has a very uncluttered layout now and unlike the older Q7, where switches like the push-button starter felt like an afterthought, all controls in the new Q7 are where they should be and fall easily at hand. The tightness of the design, seen on the exteriors, is carried nicely into the cabin too. There are four large display panels in the car - the instrumentation, the infotainment screen and the two tablets for the second row. If you have experienced the new TT, you will spot the similarity between the instrumentation panels. It's an LCD screen that is a little too in your face for my liking, but can be customised to display all sorts of relevant information - you can have animated analogue clocks for the speedo and tacho, or get additional vehicle information like roll and pitch angels or even display the entire navigation map. For the latter, I preferred using the heads up display. In fact, I ended up using it extensively since I drove the car in Switzerland and the HUD constantly kept flashing the ridiculous speed limits that have been levied on those beautiful mountain roads. Despite the roads being narrow, the Q7 never felt difficult to manoeuvre. 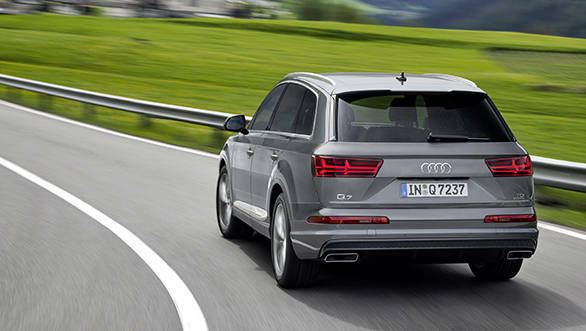 Unlike the older model, which had a certain degree of reluctance to tackle corners, the new Q7 feels more agile. It doesn't have a pronounced body roll and the grip is amazing. It simply doesn't feel like a two-tonne SUV. The quattro system does help, but what really gives the car its agility is the four-wheel steering system. The kind of stuff you get on a 911 GT3. When turning, the rear wheels also get up to 5 degrees of steering input. At slower speeds, they point in a direction opposite to the front wheels to emulate the effect of a smaller turning radius while at higher speeds the rear wheels point in the same direction as the front to make the car more nimble. The effect is surprising and a boon in tight parking spaces. But while tackling corners, you might want to set the electronic power steering to its heaviest setting even if you don't wish to attack the bends. The Comfort setting was good for the city runs, but felt quite lifeless around the twisties. Providing propulsion is an improved version of the yesteryear 3.0-litre V6 turbo diesel. It now puts out 272PS of power and a colossal 600Nm of torque! (cue for a certain Volkswagen Touareg, which will be based on the new Q7's platform). The torque is available between 1,500 and 3,000rpm, so I can't think of any scenario where the Q7's engine will be left breathless. Unless it is planning to play tug o' war with one of those massive bulls I saw on the Swiss countryside. Audi claims that the Q7 can shoot from naught to 100kmph in 6.3s. I'm guessing that is for the five-seater version with 21-inch rims. The seven-seater headed to our shores later this year will be slightly heavier and marginally slower to the ton. Let's leave those calculations for the road test then. The engine comes with a vapourisation technology now, which lets the engine run at under 1,000rpm when needed, by using very little fuel (or fuel fumes, as the name would like you to believe). Tech like this and a start-stop mechanism, along with the weight savings and a drag coefficient of just 0.32 contribute to a claimed fuel economy of 17.5kmpl. Well, the onboard computers fluctuated between 11-12kmpl on our drive. A bit of trivia - Porsche uses the same new 3.0-litre V6 engine in the new Cayenne. But for the India-spec model, it decided to stick to the older mill owing to the lower quality of diesel sold in India. Audi could take the same route, but I hope they don't. The new mill is significantly more refined and very silent. The new hydraulic mounts for the V6 do their job very well. In fact, the only thing breaking the silence of the cabin at over 120kmph, is the wind draft over the large rear view mirrors that are mounted on the shoulder line. Audi is also readying a plug-in hybrid variant based on the 3.0TDI and it promises to be an absolute cracker with over 373PS of power and 800Nm of torque. With cars like the BMW i8 and the 7 Series Active Hybrid showing promise in India, I won't be surprised if the brave Audi India considers the Q7 e-tron for our market. But that's a story for another day. The second-generation Q7 that I got my hands on is certainly coming to India soon and is a very promising package. From the way it is designed to the technology it packs and the way it performs, it will be worth the wait. In case you are interested in the Q7, do enquire with your dealer about the delicious blue shade. Dealers of luxury automobiles here at home strongly believe that there are no takers for blue cars. Let's move on from those drab whites and greys now, shall we?